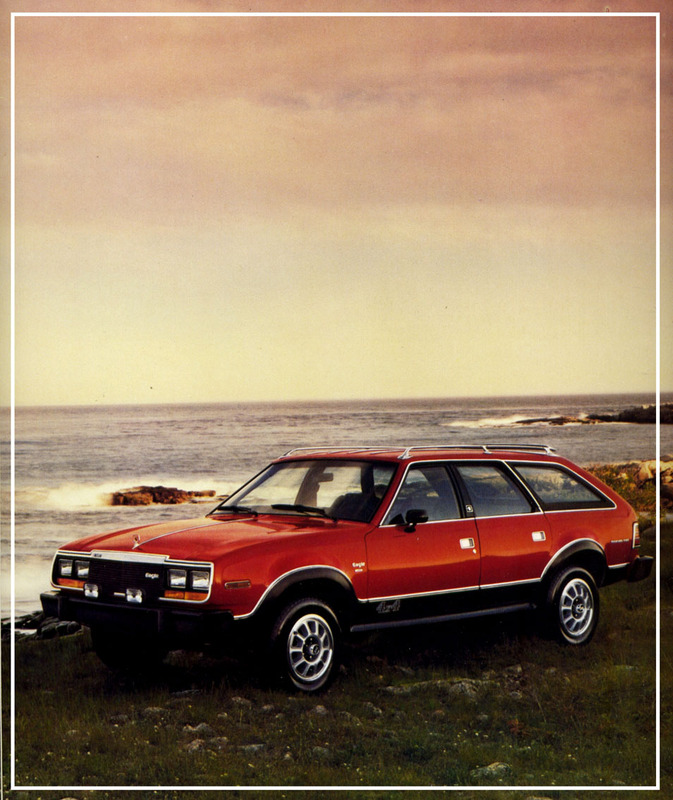 Essentially (and brilliantly) an AMC Concord with 4-wheel drive, the 1980 AMC Eagle came standard with AMC’s 4.2 liter/258 ci carbureted inline six, making a grand 100 bhp, giving a 0-60 time of around 15 seconds, and returning 16 mpg by the standards of the day. A three-speed automatic was the only transmission available to help move the almost 3,500-pound vehicle. The Eagle was available in all the Concord’s body styles, so buyers had a choice between the 2-door sedan, the 4-door sedan, and the 4-door station wagon. Standard equipment at a base price of $7,168 (for the 2-door) included power steering, power front disk brakes, and 15-inch wheels. Moving to the Limited trim level (an extra $400 or so) added a tilt steering wheel, power door locks, and snazzier interior appointments. Options included air conditioning, cruise control, power windows, and an Eagle Sport package. Station wagon page from the 1980 AMC Eagle brochure, courtesy of the Old Car Manual Project’s amazing brochures section. The Eagle had a 3-inch taller ride height than the Concord and came with a stone/gravel deflector under the front bumper and 3-inch wide fender flares. It was a major hit for AMC in 1980, selling over 46,000 units, with the station wagon configuration selling about 56% of that total. AMC would sell them through the 1988 model year for a total of almost 200,000 built. AMC Eagles show up with some consistency in the Hemmings Motor News classifieds. As I write this in January 2014, there are no 1980 Eagles, but there is a Cardinal Red 1982 2-door sedan with 44,000 miles for sale for around $7,000.